Perhaps it was our elitist, easterner mentality , or maybe it was the relatively far distance between our homes and Yishun, but it was amusing how both Wynne and I expressed surprise upon seeing a mall there. Quick stop at Yakun for breakfast before meeting the kind soul that gave up his relatively new and in excellent condition Nikon d3100 to me for $550 (yes, I feel the pinch). I am absolutely delighted to have this new toy and I hope this will spur me to take nicer pictures. If not, the fear of WASTING a hard-earned $550 will. Met up with Jarrell to test out the new camera, but not before getting lost at Outram Park MRT. Shameful really, given how many architecture assignments have been located there – I am still unable to locate exit D without mistakenly walking all the way to Chinatown first. So we made our way to Pearl Bank Apartments which was nearby. I don't know how I managed this but I had never seen this building before which made for a pleasant surprise. The building is 38 storeys high and is horseshoe shaped. The horseshoe surrounds a central courtyard, which in my opinion had really horrible landscaping. The ventilation was a tremendous success though, and the stack effect was particularly relevant in the staircase core of the building. The units are split-level dwellings similar to those in LC's Unite dHabitation. I particularly like this picture. The 'parasitic' staircases look like they are morphing from left to right. The rhythm of the protrusions make for a good picture. 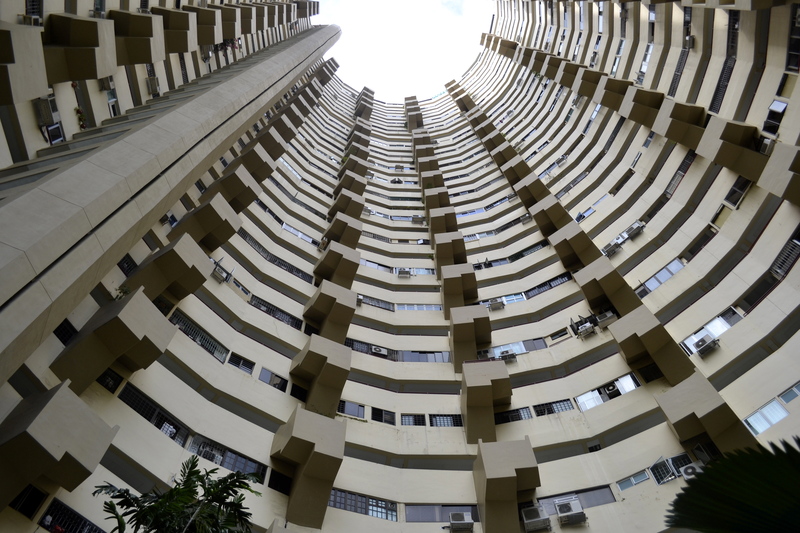 We then traipsed off to the flats at Zion Road, which will be demolished soon for en bloc. Honestly, there's not very much to see there, but the dilapidated state of the ground floor shophouses still made for some nice, but extremely cliched photographs. Minimal editing on iphoto because I am a sloth.